On Wednesday 16th January 2019, the Armed Forces of Malta have marked another important milestone and goal of enhancing and modernising the Force. The project of an additional and more capable Offshore Patrol Vessel was launched in 2015, and has since then started to take shape. The contract was awarded to Cantiere Navale Vittoria on the 10th of October 2018. Construction is planned to begin in the first quarter of 2019 and delivery of the OPV is planned for the second half of 2020. 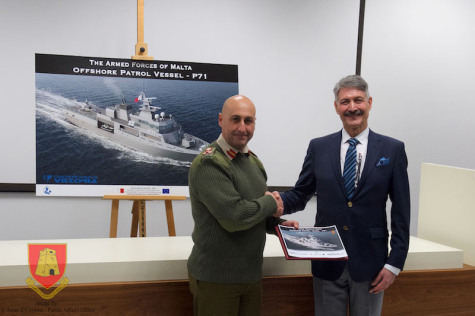 In a speech by the Commander of the Armed Forces of Malta, Brigadier Jeffrey Curmi stated that "The response of the shipbuilding industry was overwhelming.This Offshore Patrol Vessel had to have more endurance, better sea keeping and provide better living conditions for our crews. “Furthermore, we wanted this new Offshore Patrol Vessel to have improved life-cycle costs in order to ensure that its operations could be sustained in an efficient and effective manner along the years, including better fuel consumption and maintenance costs". The ceremony ended with the signing of the contract by Brigadier Jeffrey Curmi, Commander AFM, and Mr. Luigi Duo, the President of Cantiere Navale Vittoria SpA.